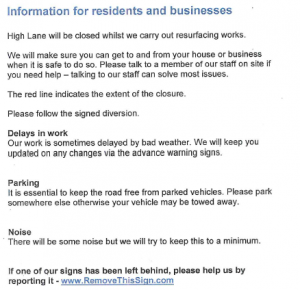 Please read here the resident letter for the resurfacing work on High Lane, Haslemere. The letters are due to be delivered over the next couple of days. The works are scheduled to start on 23/0/3/17. Sometimes the council’s plans have to change, often due to bad weather or problems on other works in the same programme which can have a knock on effect. If anything changes with the details of these works, we will let you know. If you have any questions please do not hesitate to contact the council on 0300 200 1003 or email works.communication@surreycc.gov.uk. 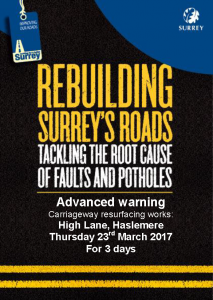 This entry was posted in Haslemere first and tagged Haslemere, High Lane, Roadworks, Surrey County Council on March 6, 2017 by admin. This entry was posted in Haslemere first and tagged Haslemere, High Lane, Road Resurfacing, Surrey County Council on December 6, 2016 by admin. Please note a temporary road closure, the effect of which will be to temporarily prohibit traffic from entering or proceeding along that length of (D5516) High Lane, Haslemere, between its junction with Derby Road and its junction with Chatsworth Avenue. This Temporary Traffic Order is required to enable The Clancy Group to repair a broken main in the carriageway. These works are anticipated to commence on the 4th January 2016 for two days between the hours of 07.00hrs and 19.00hrs within the three-month period of operation of this Temporary Traffic Order that commences on 4th January 2016. It is anticipated that this length of High Lane will remain closed at all times during this work. Advanced warning signs will be displayed and the temporary closures will only operate when the relevant traffic signs are displayed. Access will be maintained for pedestrians, residents and emergency vehicles at all times. Traffic will be diverted via Weycombe Road, Whitfield Road, Pepperham Road and Chatsworth Road. 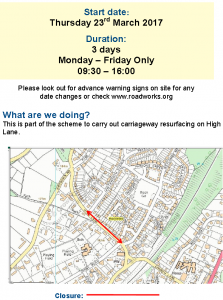 High Lane – diversion and site plan. This entry was posted in Haslemere first and tagged Broken Main Repair, Haslemere, High Lane on November 28, 2015 by admin.